"He needs to be heard across America. His voice, his experience, his passion needs to be heard across America so Alaska can contribute more." Alaska Senator Ted Stevens was joined by governor Sarah Palin Wednesday at a press conference laying out Stevens' proposals for relief from high energy prices, but reporters wanted to know about the perceived friction between the two. "We're each free to make comments about what the other does and every once in while she'll say I'm stupid," Stevens said to laughter among reporters. "She may be right." "I have great respect for the senator," she said. "He needs to be heard across America. His voice, his experience, his passion needs to be heard across America so Alaska can contribute more." Palin made remarks in September calling for Stevens to explain why the FBI is investigating the remodel of his resort home in Girdwood, Alaska that was done by an oil services company who's owner admitted to bribing Stevens. "I do think the governor had every right to say what she did. I didn't entertain any umbrage about it. I never talked to her about it at all. I wish I had her freedom to speak about it, but I don't. It's there, it's continuing and that's all there is to it," Stevens said regarding the governor's remarks. Stevens and his son Ben are under multiple criminal investigations for extortion, tax evasion, and bribery charges relating to Alaska's legislature and fisheries issues. 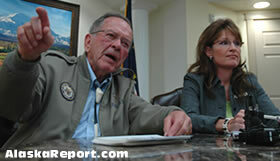 Governor Sarah Palin and Senator Ted Stevens also laid out their energy plans today. Governor Sarah Palin today joined Senator Ted Stevens in publicly discussing energy initiatives currently under way on the state and federal levels to alleviate the financial burden on Alaskans and provide for immediate and long-term relief. "The Senator and I are working closely together in addressing the needs of our current energy crisis," said Governor Sarah Palin. "We wholeheartedly support the Senator's four-pronged approach that relies on domestic energy development coupled with alternative energy development, conservation, and legislation that protects Alaskans from anti-development litigation and protects all Americans from the impact of unchecked market speculation." Over the course of the last few months, the Governor has unveiled a multi-phase statewide energy plan that puts Alaskans first and mirrors the Senator's efforts on the national level. The Governor's plan includes a statewide energy coordinator and contains three major components: immediate short-term relief through energy rebates and state gas tax suspension; intermediate steps, which include the development of reliable energy alternatives as well as a possible bullet line for transporting North Slope natural gas to Southcentral; and then the long-term plan, which includes the overland gas pipeline to the Lower 48 that maximizes jobs for Alaskans, gas for Alaskans, and revenue for Alaskans. "This synergistic relationship with the state and federal governments working hand-in-hand during this delicate time is welcomed and necessary, and the Senator and I look forward to combining our efforts to help Alaskans work through this energy crisis," the Governor said. "Additionally, Alaska has always played an important role in providing reliable domestic energy to the Lower 48, and we will continue to be a part of the nation's energy solution as they look to us for assistance."